There have been many changes with us at Inglenook Tile Design over the last months. We have moved our tile-making operation from our warehouse in Kinzers, PA, to a work facility for the blind and vision-impaired in northeast Philadelphia. I am now working from a home office, in Lancaster County, PA, and making periodic trips to the new warehouse. We had a rocky start, when our large kiln was dropped during the move, but everything is now running smoothly. My new office number is 717-806-3900. I still meet with customers at my home office, and have loose tiles and concept boards to show. If you would like to visit, please call me to make an appointment. 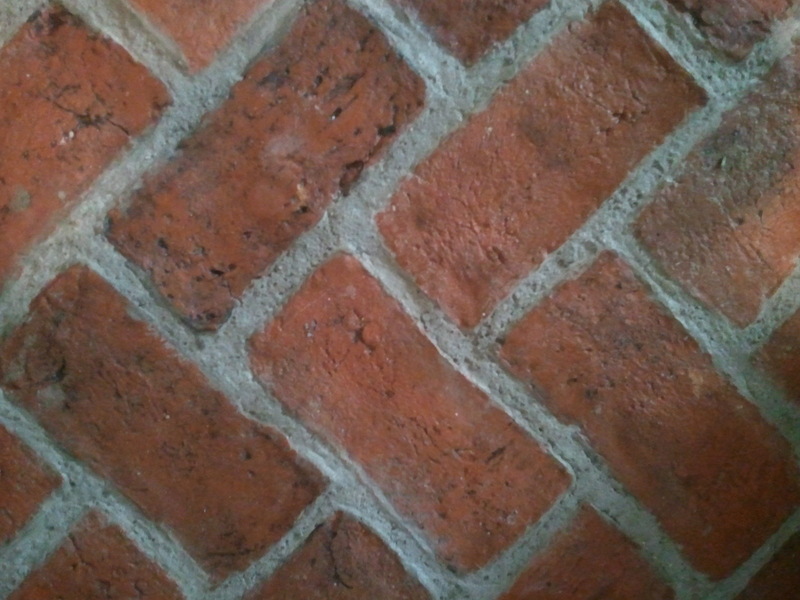 Many of my visitors have liked the brick tiles in my front entryway, and so we have made a mold of this style, and called it Wimers Mill. This tile is slightly smaller than our usual 4×8″ tiles, with a textured top and a very rugged edge. The grout lines need to be wider, as a result of these uneven edges. What I did with my own floor was to press tiny pebbles from our stream into the mortar. When I sealed the floor, it also shined up the tiny pebbles. The black in the texture was done with a water-soluble shoe polish. It can be found at any Dollar Store — the Kiwi polish with a felt tip. After I used a low gloss sealer on the floor, I squeezed the black polish into some of the texture, then wiped off the top with a damp rag. After it dried, I sealed the floor again. I did the same with the mortar. This lovely kitchen is a picture shared by the Cahill family, who visited my home office before Christmas 2011. If you haven’t visited our Facebook page, please follow my regular posts, at Inglenook Tile Design. If you click “Like,” you will see pictures in your news feed. Our daughter, Emily, will be getting married this summer in our back yard. She and her cousin started a Pinterest board, called Em’s Fairytale Wedding. I started posting ideas on that, and then started another “For The Home,” which also has postings of Inglenook Tile Design pictures (as well as other things I like, and links to some other artisans I know). That board can be found under my name, Julie Good-Kruger. There is a limit to how many pictures I can put on the website, and our customers often generously send us photos of their projects. This gives me a chance to post many more pictures than you will be able to otherwise access. Posted in Tiles on April 30, 2012 by Inglenook Tile Design.